Yes, Genghis Khan is still coming to Dallas! Although I promised that we would be visiting the exhibit right after the last post, time has gotten away from me. However, F&B have a swim meet in Irving this coming Saturday. So since we're already going to be in Irving, we are going to take in the Genghis Khan exhibit at the Irving Arts Center this Saturday. Since I wasn't sure how long we might have, we decided to each figure out what the one thing we wanted to see was, 3 people, 3 specifics! My Egypt-loving girl was thrilled to find out there was a whole new category of mummies to look at! 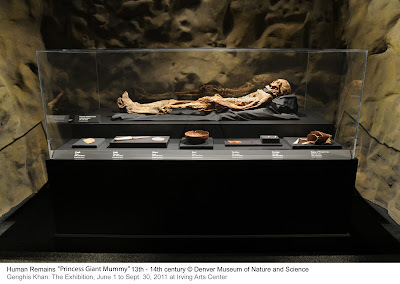 The Khan exhibit mummy is a Mongolian noble woman, discovered in a cave in the Western Gobi Desert. Silk brocade robes, pearl earrings and other artifacts are displayed alongside the mummified remains of the The Princess Giant. Just perfect for Miss Faith! Mr. Ben was eyeing the bow and arrows, typical little boy! From the website, we discovered Genghis Khan’s powerful army used innovative siege warfare tactics to conquer walled cities. There is a full-scale replica of a traction trebuchet and a large siege crossbow. As for me, I think this golden Buddha is so pretty! 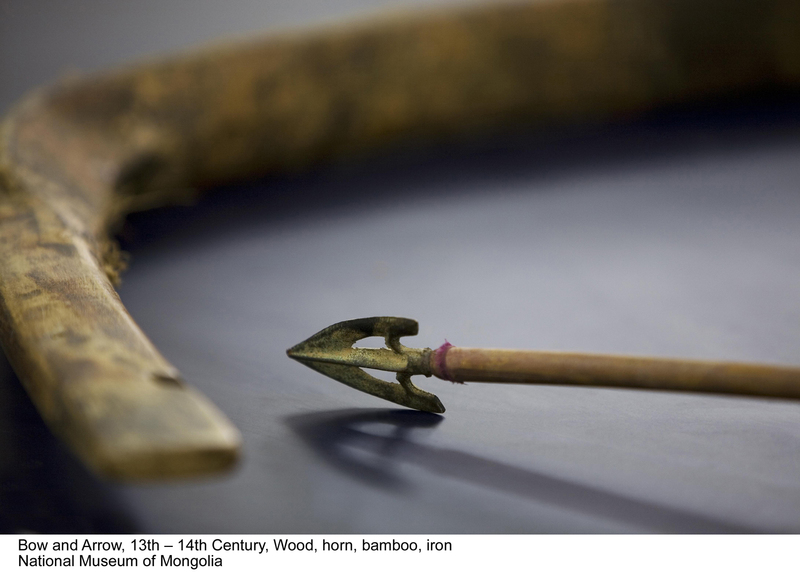 I'm looking forward to the artifacts--gold jewelry, ceramics, coins, seals, instruments and clothing. I always find those kinds of things fascinating (hoping F&B will let me read all the exhibit info too)! 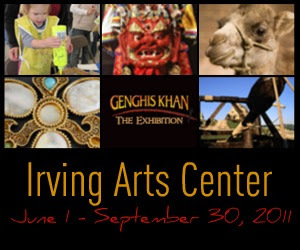 The amazing Genghis Khan exhibit is hosted by the Irving Arts Center from June 1 through September 30, 2011. Besides the exhibit, the Art Center is hosting special events, including Family Khan Days. 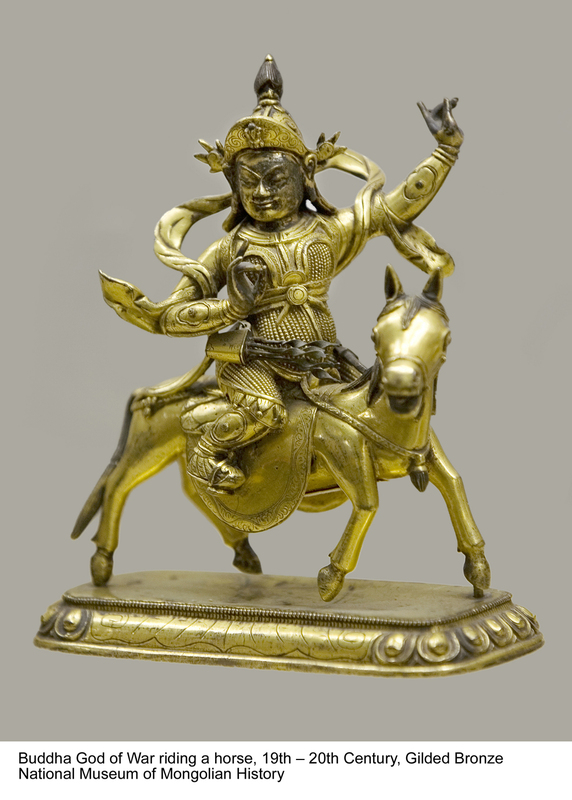 This post is sponsored by the Irving Arts Center, host of the Genghis Khan Exhibit. I was provided with tickets to the exhibit and compensation for my time. All opinions expressed are my own.